Best South Yarra functions, party, event space, room & venue hire guide. Looking for a South Yarra function room, birthday party venue or unique event space to hire for your next celebration or occasion? Listed are Restaurants, Bars, Pubs, Nightclubs and Hotels that specialise in birthday parties, engagements, weddings, cocktail parties, christenings, corporate seminars and conferences, which make it simple for you to organise. The Mission Rooftop in Prahran is a unique Melbourne rooftop venue. This modern rooftop function space has spectacular city views across Melbourne's skyline, offering a private experience that your guests will never forget. Perfect for all types of celebrations from small business meetings, conferences, cocktail parties and sit down events. The Mission Caters Rooftop is split into two indoor wings with large adjoining outdoor balconies, offering exclusive views of Melbourne spectacular city skyline. The venue can be set up specifically for your needs & can cater for all types of events including everything from conferences and meetings to cocktail parties & sit down dinners. Matched with The Mission Caters specialty catering, your event will be managed best to suit all your food & beverage requirements. All venue sales supports long standing charity Prahran Mission with 100% of all venue income supporting people in the community suffering from mental illness. By holding your event at Prahran Mission, you are changing lives forever. To discover more about our unique rooftop venue, contact us to arrange a guided tour. The venue is available for hire 7 days a week and is fully licensed. Prahran's favoured function venues. Book their karaoke room or courtyard or both for an event to remember. Their emphasis is drinks paired with casual Japanese food, perfect for all of your guests to share and enjoy. with optional menu choices and personal bartender in the Karaoke room bar. It can also be booked alongside the stunning Japanese beer garden for bigger events and more freedom and space. filtering through the covered ceiling and the many colourful parasols, and coloured light bulbs for illuminating late night conversations over cocktails, this space will set up your function for closeness. Roc’s is located in the heart of South Yarra inside the Jam Factory complex, and is tailored to those seeking a sophisticated venue. The stylish interior, reflecting a quintessential New York scene, compliments the Chapel Street experience. Named after Roc Kirby, founder of Village Roadshow and a pioneer of the Australian Film & Cinema industry, Roc’s Jam Factory is a bar perfect for entertaining clients and holding presentations in an environment that will indulge all your senses. Mix business with pleasure in this unique venue enjoying dishes highlighting flavours from around the globe with an array of the finest hand selected wines, beers and seasonal and fresh cocktails. Roc’s is available for meetings and presentation packages catering for a formal presentation, corporate event, celebrations and wedding reception. Venue available for exclusive hire and for semi-private bookings for smaller groups, minimum spend may apply. Choose from a selection of premium beverages, canapes, sweets and savouries to create the perfect package for your next event or celebration. We love Victoria and feel no need to stray to far away to find some of the finest and freshest produce available. We strive to support local producers and farmers! We keep things uncomplicated on the plate in expressing all their hard work through our food. Set within the cosmopolitan suburb of Prahran, centrally located on the main corner of the iconic Greville Street precinct, Oscar Cooper is a unique private space perfect for a multitude of occasions. Your guests are guaranteed to be impressed with our elevated setting overlooking one of Prahran’s most prominent corners, our modern urban-industrial interior is a warm combination of recycled local materials and high end finishing. Oscar Cooper is an ideal venue for your engagement, wedding, birthday or corporate event. Allow us to amaze your guests with our extensive drinks selection and our creative in house catering. Our dedicated team of chefs are on hand to create a range of delicious canapés ideal for your event. Pawn and Co., the first bar in the Universe where everything is for sale, from the chair you sit on to the glass you hold, to the 1940's taxidermy albino kangaroo. Founded in 2003, Mofo Lounge and Morocco Lounge are two unique and specially themed venues located on the 1st floor and ground floor of Greville St Prahran. We specialize in functions – it’s what we do and what we do best. We have been hosting functions for over 10 years and we know our stuff when it comes to throwing a party that will definitely leave a lasting impression on your guests long after your function has concluded, ensuring your friends, family & work colleagues will always remember your occasion for all the right reasons. Small enough so you don’t feel lost in the room, yet large enough to mingle and lounge around. Mofo lounge is the perfect intimate venue for smaller groups who want an entire bar and function space for their private use. With large windows that open onto the street, Moroccan inspired décor, low lighting, comfy daybeds make it for hens parties and small gatherings. A stunning events space adorned in rich Arabesque tapestries, large ornate mirrors and antique lanterns from Morocco which dapple the walls with intricate patterns. Large luxurious daybeds, a private bar and private dance floor make this an impressive setting for any special event. - You will have exclusive use of the entire venue for the duration of your event. - Photos, Presentations & DVDS: Choose to have a slide show or play a DVD to highlight your memories or add to the theme. - Music: Provide your own iPod, or DJ. Alternatively, we can arrange this for you. - Food: Select from individual food items or discounted food packages based on your budget and guest numbers. - Belly Dancers: Exotic belly dancers to add that extra special touch to your evening. - Tarot Readers, Palm Readers & Henna Artists: All fantastic additions to any function and experts in their talent. - Shisha Pipes: A variety of flavored shisha pipes to complete your Moroccan experience, ranging from apple, strawberry, mint, grape and many others. Lolly Buffet: Graze throughout the event and take home bags provided make for a perfect party favour. To enquire please call or email our dedicated functions manager Caitlyn Wright. The Emerson is a place of endless possibility – day or night! This unique multilevel venue inspires and captivates, offering the perfect combination of elegance, fun and contemporary style with Melbourne’s laid-back sophistication. Spanning Club, Cocktail Bar & Lounge and Rooftop, The Emerson invites you to eat, drink and play under one roof with their a la carte menu, premium beverage selection, booth packages, VIP service and private event options. An elegant and sophisticated yet casual space, set against a vista of South Yarra and Melbourne’s CBD. The fully retractable roof and generous heating will keep you warm in winter and cool in summer providing the perfect space for any experience. 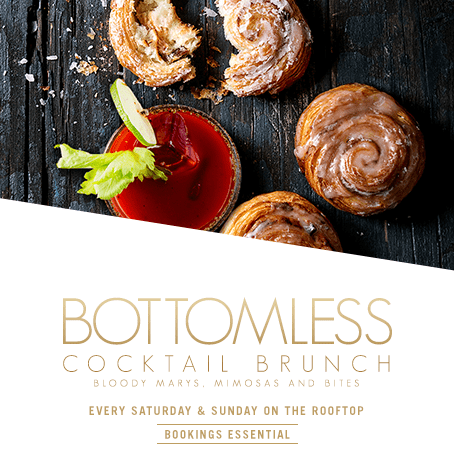 The Emerson Rooftop offers booth packages ultimate in both day & night celebration, full space hire for weddings and private events, live cooking station and a menu of Modern Australian dishes designed for casual dinners or sharing amongst friends. A place of hidden pockets and secret corners, unique light fixtures and sumptuous textures, this is the ultimate in intimate event spaces. With private booths and lift access, discreet amenity access and a bird’s eye view over the main dance floor, this level is designed to be enjoyed all night long, exclusively removed from the fevered pace below. The striking cocktail lounge area features plush low level lounge style seating separated to provide exclusivity yet immersed in the atmosphere of the rooftop and club, perfect for an intimate event or seated dinner. Designed for absolute enjoyment, The Emerson Club brings the sounds of resident and international DJ's, spectacular lighting, aerial entertainment and a VIP experience to create the best atmosphere, ambience and experience for all in Melbourne. The beauty is in the details - from the carefully appointed grand bar, to the lush booth seating areas that fill out all the best corners of the club, complementing the flow to bring you up close and personal with the DJ and dance floor. Please Call or Email the Venue above to make a Booking! Bacash is situated on Domain Rd, South Yarra, close to the CBD, and only a short walk through the Botanical Gardens to the MCG and the Rod Laver Arena. Bacash Restaurant follows up on a reputation of fine seafood cooking earned at Michael and Fiona's first restaurant Toofey's. Michael and Fiona owned and operated Toofey's between 1989 and 2001 until they relocated to the more desirable surrounds of the beautiful Domain Road Village. Whilst at Toofey's Michael only cooked seafood, and since opening Bacash he has diversified the menu to appeal to a wider clientele. His uncompromising approach to quality has led to the restaurant being awarded Chef's Hats in the Age Good Food Guide from 2005 through to the most recent 2014 edition.